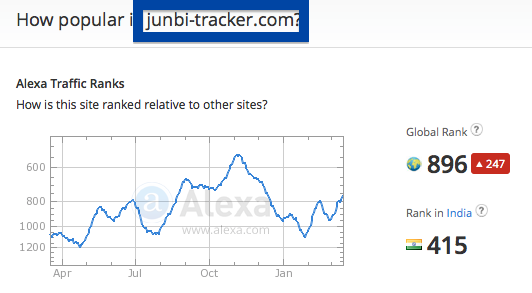 Did you just get a pop-up from t2.junbi-tracker.com and ponder where it came from? Did the t2.junbi-tracker.com ad appear to have been popped up from a web site that under normal circumstances don’t use advertising such as pop-up windows? Or did the t2.junbi-tracker.com pop-up show up while you clicked a link on one of the major search engines, such as Google, Bing or Yahoo? If you also see this on your system, you most likely have some adware installed on your computer that pops up the t2.junbi-tracker.com ads. There’s no use contacting the owners of the site you currently were browsing. The ads are not coming from them. I’ll do my best to help you remove the t2.junbi-tracker.com pop-up in this blog post. I found the t2.junbi-tracker.com pop-up on one of the lab machines where I have some adware running. I’ve talked about this in some of the previous blog posts. The adware was installed on purpose, and from time to time I check if anything new has appeared, such as pop-up windows, new tabs in the browsers, injected ads on site that usually don’t show ads, or if some new files have been saved to the hard-drive. So, how do you remove the t2.junbi-tracker.com pop-up ads? On the machine where I got the t2.junbi-tracker.com ads I had TinyWallet, BlockAndSurf and BrowserWarden installed. I removed them with FreeFixer and that stopped the t2.junbi-tracker.com pop-ups and all the other ads I was getting in Mozilla Firefox. The issue with pop-ups like this one is that it can be initiated by many variants of adware, not just the adware that’s installed on my machine. This makes it impossible to say exactly what you need to remove to stop the pop-ups. You can also check the add-ons you installed in your browsers. Same thing here, do you see something that you don’t remember installing? Did this blog post help you to remove the t2.junbi-tracker.com pop up ads? Please let me know or how I can improve this blog post.